The Indian space agency's commercial arm Antrix Corporation is waiting for India Inc to enter the multi-billion dollar space business in a big way and invest in making and launching rockets and satellites for customers worldwide. "There is big money to make in the space business for Indian corporates. We do not mind whether it is Tatas, Birlas, Ambanis or someone else, as there is no dearth of big corporates in India to invest in the space industry," Antrix Chairman and Managing Director S. Rakesh told IANS in an interview here on the margins of a space trade event. Admitting that the Indian space business, driven solely by the state-run Indian Space Research Organisation (ISRO), had been frugal, Rakesh said India Inc was not looking at space as a business, as it had not been generating much money hitherto. Not anymore. As the global space business is a whopping $330 billion (Rs 23 lakh crore) and growing 2-3 per cent annually, there is huge money for Indian corporates to make in the Small Satellite Launch Vehicle (SSLV) market and sending satellite constellations for various activities spanning civilian and military use. "As ISRO's programmes (launches and satellites) are primarily meant for societal and the country's needs in the civilian and defence sectors, the spare capacity is small for commercial needs. We hope the private industry will come forward to drive the commercial space and grow the business," Rakesh said. Clarifying that as a space research organisation, although ISRO's responsibility was not to grow the commercial segment of the space industry, Rakesh said it, however, was proposing the SSLV programme for involving the industry directly in making smaller rockets. "The Indian industry has to proactively involve and suggest manufacturing methods, which is not our strength as a research entity," he asserted. 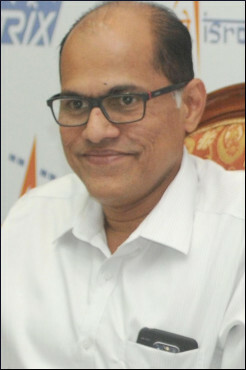 Referring to the growing demand for real-time pictures and data from earth observations in the market in commercial and defence areas, Rakesh said the industry had to come forward to make SSLVs as well as PSLVs, the manufacturing of which the space agency is keen to privatise. With a cost one-tenth of a Polar Satellite Launch Vehicle (PSLV), the 34m-long SSLV will be used to launch smaller satellites that weigh 500-700 kg. The low-cost SSLV requires a dedicated launch pad with a simple vertical launch mechanism, the Antrix executive said. With ISRO looking at 50-60 SSLV launches a year, it wants the private industry to design, develop and manufacture them. The space agency is also looking at many places on the east coast, including Tamil Nadu, to set up the SSLV launch pad, as it will be mostly for commercial purposes. "Though SSLV will be initially launched from our rocketport at Sriharikota in Andhra Pradesh, we want to have a separate spaceport for it later," Rakesh stressed . The market for small satellites is estimated to be $18 billion (Rs 1.27 lakh crore) over the next 10 years, with a potential to generate Rs 1,500-2,000 crore business per year for India alone, he noted. Even as there is a lull in the global space market currently, there will soon be a huge demand, on which India can capitalise, as it has the required technologies, which not many countries do, said Rakesh, ahead of the sixth edition of the biennial Bengaluru Space Expo in this tech hub on September 6-8. Rakesh also noted that the "negative" attitude of the corporates towards the space business was hurting despite the country having very good technologies and a huge opportunity to do business. "We are looking for someone to be willing to put money in the space business," he affirmed. The world over, companies like SpaceX are able to produce launch vehicles (rockets) despite its technologies being exclusive and the quality required is of high standard. Hence, the Indian space agency is also looking at massive technological transformations. "Many design concepts are changing in the space industry. Satellite constellations are being looked at as they give the advantage that if one component does not work in space, the rest of the constellation continues to function," he pointed out. Of Antrix's Rs 2,100-crore turnover in fiscal 2017-18, launch services contributed Rs 250 crore. "We have an order book of Rs 980 crore, with Rs 500-600 crore contracts in pipeline for launch services in this fiscal (2018-19) and next fiscal (2019-2020)," added Rakesh. With ISRO eyeing two launches a month to meet the country's growing demand for multi-purpose satellites, the space agency and its commercial arm have busy years ahead.